Ahem. Yes, is this thing on? Today, I am going to talk about a very special group of dolls. Their name is…The Düeren family! They are 5 sisters (Marie, Grace, Hazel, Willow, and Adeline). Almost the whole Düeren family is supposed to be my mini-me, BTW. Katelyn (my first doll) is kinda my younger self mini-me, like me at age 8 or so. I’ve changed quite a bit since then, so that is why Grace and Marie in particular are my going to be my new mini me-s. They don’t look like me, necessarily, but in personality they’re really similar. FYI, Grace and Willow might swap wigs. For now, though, this is the plan. Marie is spunky, yet sweet; sarcastic, yet smart; logical, yet slightly crazy; and somewhat quiet, but very nerdy. 🙂 She speaks (like me) in Ye Olde English. Her “cause” is illiteracy. She is an INTJ from Ravenclaw, though she wouldn’t mind Slytherin, either. 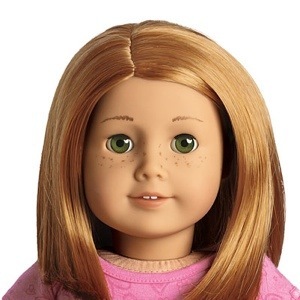 FYI, Grace will be customized to have freckles and the Bavas International Glamour Girl wig in Auburn. One of the oldest twins, Grace is pretty much my more extroverted side. She loves dancing, acting, doll-stopmotioing, all of Noel Streatfeild’s books, directing, sewing, designing clothes, learning about people from around the world, gymnastics, playing with her dolls, blogging, and singing. She takes lyrical, ballet, tap, Scottish, Irish, and jazz, and is in the performance / competition troupe at her dance school. Grace is……crazy. Extroverted, talkative, positive, bossy, encouraging, funny, quick-thinking, somewhat annoying, thoughtful, and the kind of person who will comment on almost every blog she sees. Her “cause” is diversity, in any way, shape, and form. She is an ESFP loyal to Gryffindor. One of the youngest twins, Hazel is very into music, LotR, dolls, gardening, building things out of wood, lacrosse, Disney, art, and nature. She plays viola, violin, piano, and flute, and also sings. She likes to stop motion, and uploads all her AGSMs to AGtube. Hazel is pretty quiet and introverted. She’s a bit shy, though she will talk a mile a minute after she knows you better. She’s very sweet, and her “cause” is making sure that people are not homeless. Hazel is a loyal Hufflepuff, and a INFP. FYI, Willow will have a RRG Curly Auburn Parting Wig, freckles, and possibly some more cheek color. One of the youngest twins, Willow is pretty much my artistic and crafty side. She loves art, designing doll clothes, sewing, knitting, crochet, ice skating, woodwork, painting, felt-crafting-thingies, finding weird dresses at thrift shops and updating them, and listening to weird music. She is a crazy, energetic, temperamental, sometimes reckless, not-thinking-things-through, life of the party type gal. She throws herself into anything and everything, though usually loses focus after a few hours, so there are many half started projects lying around her room. Her “cause” is girl’s rights. Not everything associated with that, but some of it. Willow is an ISFP, and is in Gryffindor. Adeline isn’t exactly the girls sister–she’s actually their cousin, though she lived with them until her 9th birthday, when she moved to Sao Paulo with her family. Adeline loves lots of different things, and from day to day it changes. She seems to like art and crafts stuff, but the type changes often. BTW, who are Sophie and Annika? Eeek you saw it! Yay! Annika is #55, Sophie is #24. 🙂 Though actually Claire and I decided yesterday that instead of getting #24 we’re getting OG Leah and giving her freckles, because she’s just as cute as Sophie. She’s going to have the same thing and everything, and still be related to the Duerens, though.